Sri Lanka Army troops at Parameswara Junction. At least seven people were injured and rushed to Jaffna Hospital. The demonstrators were scheduled to hand over an appeal to the Sri Lanka Monitoring Mission protesting the increased harassment by the Sri Lanka Army soldiers on the student community in Jaffna and the alleged involvement of Sri Lanka Navy men in the killing of a young woman in Punguduthivu on Saturday. Journalists covering the students demonstration were also attacked by the soldiers at Parameswara junction. Thinakural staff reporter Mr. N. Sabeswaran, Uthayan reporter N. Pradeepan, Thinakaran (Lake House) reporter Wintson Jeyan and Namathu Eelanadu reporter Mr. I. Jerad were beaten up by the troopers. The soldiers also smashed their digital camera equipments, media sources said. The peaceful demonstrators were dispersed by the sudden gunfire and the attacks launched by the soldiers. 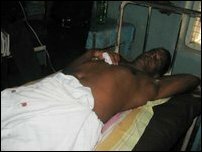 Professor N. Perinpanathan admitted to the Jaffna Hospital with gunshot wounds to the thigh. A three-wheeler was smashed by SLA troops. Arts faculty student Mr. Thiruchenthuran, 22, and a Management faculty student Mr. I. Senthil,23, were also among the wounded admitted at the Jaffna Hospital, medical sources said. Mr. T. Rooban, 38, who was driving the three-wheeler leading the march with loudspeakers fixed on his vehicle to broadcast slogans, was also attacked. The three-wheeler was also smashed by the soldiers. The Jaffna University Student’s Union has called for an emergency meeting following the attack on the demonstration. Meanwhile, a large number of autorikshaw drivers gathered in front of the SLMM office at Temple road Monday noon to protest against the recent attacks on their colleagues by SLA soldiers.